The World of Smog: Rise of Moloch is a Victorian adventure board game, for 2 to 5 players, set in an alternate England, where magic and technology have taken an extraordinary turn. Playable as a campaign or solo adventures, Rise of Moloch puts one player in the position of the Nemesis, against the intrepid Gentlemen controlled by the other players trying to save the Crown. Secretly activate the order of your characters through different scenarios, enjoy your steam power weapons, and save your special actions for the most opportune moments - you surely don't want to make your opponent stronger! 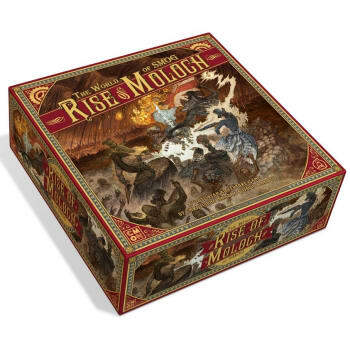 Rise of Moloch is a campaign driven adventure, played over a series of missions, each telling part of the overall story of Moloch's rise to power (or defeat at the hands of the fearless Gentlemen!). Each mission features a unique board setup and goals for both the Nemesis player and Gentlemen players to complete. More so, subsequent missions will be impacted by the outcome of the one before it, weaving the overall story and game-play together to make each campaign unique.